Remember 'Open Schools'? Probably Not, And Here's Why : NPR Ed 'Open Education' was a big idea half a century ago. Kids were supposed to move around, learning in groups or exploring on their own. But, within a few years, the movement faded. So, what happened? 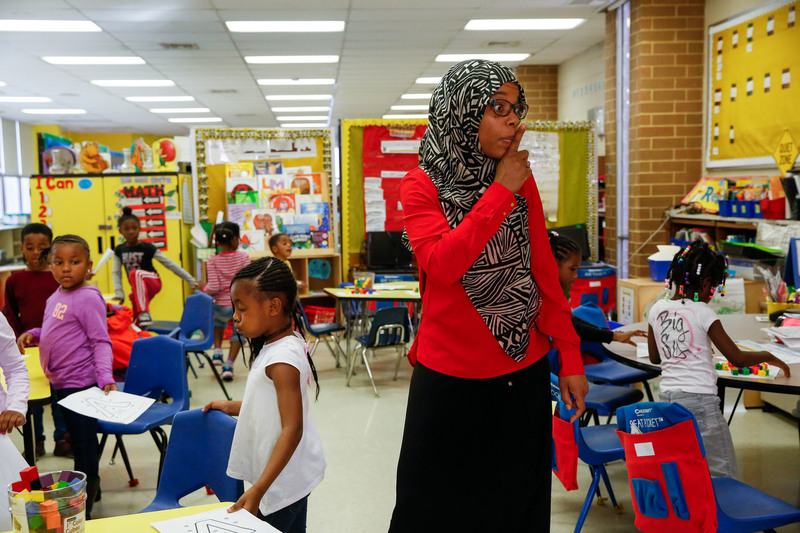 Tomiko Ball's classroom at Orr Elementary School in southeast Washington, D.C. It's a perennial debate in American education: Do kids learn best when they're sitting in rows at their desks? Or moving around, exploring on their own? Back in the 1960s and '70s, that debate led to a brand new school design: Small classrooms were out. Wide-open spaces were in. The Open Education movement was born. Across the U.S., schools were designed and built along these new ideas, with a new approach to the learning that would take place inside them. It was a response, historians say, to fears that the U.S. was falling behind in key subjects like science and math. 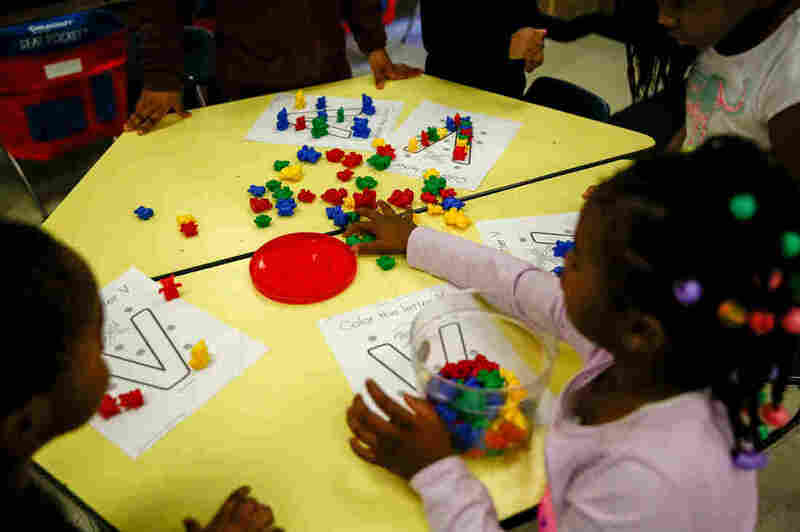 The approach "resonated with those who believed that America's formal, teacher-led classrooms were crushing students' creativity," Larry Cuban, a professor emeritus at Stanford University, wrote in 2004. "No whole-class lessons, no standardized tests, and no detailed curriculum," he wrote. "The best of the open classrooms had planned settings where children came in contact with things, books, and one another at 'interest centers' and learned at their own pace with the help of the teacher." Sounds great, right? But within just a few years — by the late 1970s — the open schools movement had faded. A backlash set in. "Traditional schools sprang up in suburbs and cities," Cuban wrote. "This time the call was not for open education but for a return to the basics." Of course many open schools remained in operation long after that. I remember visiting one in Detroit in the 1990s, when I was a student teacher. By then, open schools were already an endangered species: education's equivalent of a red-cockaded woodpecker. Or a Ford Pinto. Recently, I ran across another survivor just a few miles from NPR headquarters in Washington, D.C. What better place to explore this mystery than a visit to Benjamin Orr Elementary School? I asked the principal, Carolyn Jackson-King, what she thought the philosophy behind this model was back in 1974 when the school was built. "I think it was mainly for collaboration for teachers," she explained. "A lot of times, teachers are in their silos, by ourselves, doing our own thing." 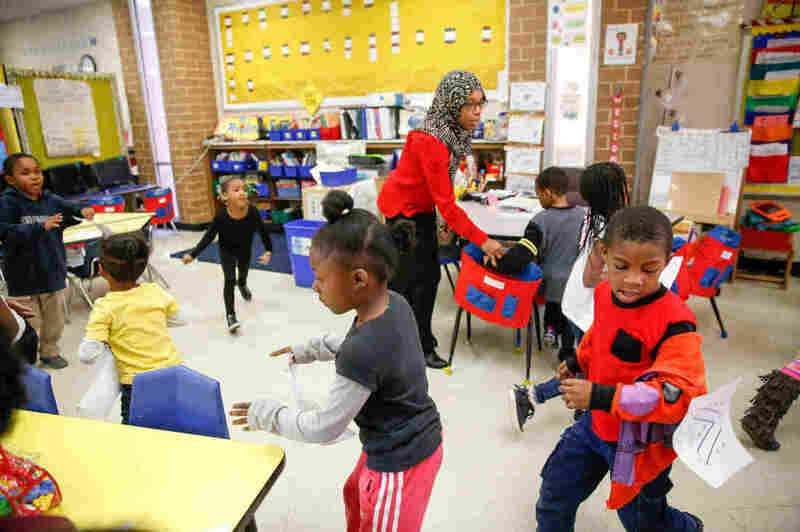 The openness allowed them to work together and students too: "If I'm a first-grader doing second-grade work," Jackson-King says, "I could easily go over to that second-grade classroom and work." Tomiko Ball's students at work in Orr Elementary in southeast Washington, D.C.
To see all this in action, Jackson-King hands us off to an educator who knows this building inside and out: Marlon Ray, Orr Elementary's director of strategy and logistics. He takes us upstairs. "Here we have three first-grade classrooms, in one huge space," Ray says. At one end of a long, vast room — maybe 30 yards from end to end — Dyanna Gardner's class is working on a poem and song about Dr. Martin Luther King Jr.
"D! R! E-A-M!" they sing. "We have to work out these kinks," Gardner tells her students. "You have to practice this like 20 times tonight." About halfway down this space, a second class — Marquitta Johnson's — is having a silent-reading exercise. But when we stop to watch, I notice that you can still hear the other class singing off in the distance. Marlon Ray takes us upstairs again, where we meet some second-graders. They're working on writing sentences. "Same concept," he explains. "Same layout." Three classes, one big space. And this is about the point where I'm starting to notice something about this "open" school. "You know what I don't see?" I ask him. "A lot of 'openness.' "
Marlon Ray laughs. Everywhere you look, there are partitions, bulletin boards on wheels, crates stacked up high. "Metal cabinets," Ray says, "bookshelves, hanging, dangling things." And so, I ask Marlon, here in this school without walls, they've created ... "Walls," he finishes. "Oh, boy!" she says. "It's a bit difficult at times." Ball says she came to this building "because of the principal" — the chance to work for Jackson-King. She loves the students and the other teachers, too. But the open floor plan? She can't get used to the noise. Every teacher has a different noise level, Ball says, and that takes a lot of adjustment. "This is my noise level, this is another noise level." Teaching here, she adds, takes a special mindset: "You have to put it in your psyche to say, 'I'm going to make this work, I'm going to do the best with what I have.' "
Every teacher has a different noise level, Ball says, and that takes a lot of adjustment. "This is my noise level, this is another noise level." Historians say that's pretty much why this open school design died out. Bottom line: Too loud. Too distracting. Teachers hated it. The open school model tried to tear down the walls and barriers, and for 40 years teachers at this school have been putting them back up. Chalk it up to another education fad that came and went. There's more to all this of course. Larry Cuban notes that it wasn't just that teachers didn't like it. Societal and cultural factors intervened, too. "In the mid-1970s," he writes, "with the economy stagnating and the nation deeply divided over the Vietnam War, critics again trained their sights on the public schools." Now, concerns were that standards had slipped, that schools were too free and open. A "back-to-basics" mood set in. At schools like Orr Elementary, teachers and students learned to adapt. "It's all I know," says Julie Morgan, Orr's instructional coach, who's been teaching here for 24 years. Morgan says the model does lead to collaboration. "We communicate well, we're a close-knit staff. I attribute that to the openness." Like it or not, this building is facing extinction — they're going to tear it down this year and build a new one next door. And across the city the vestiges of the Open Schools era are disappearing. Here's how the DC schools website puts it, "Open space is a challenging educational environment for today's teachers and students and DCPS is in the process of enclosing or replacing all of these schools." At Orr, the educators are ready — not just for the learning space, but simply to have modern heating and cooling and all the other conveniences a new building will bring. And while the movement itself may have crashed, many of the concepts and ideas behind Open Education remain — they're a big part of what lots of schools around the country are trying to do: Collaboration. Independent, student-centered learning. Exploration. And here at Orr, when they get that new building? Those things aren't going away, either. "The openness is in the room, the collaboration still exists," Tomiko Ball says. "Whether there's walls and doors or not." Ball says open education isn't so much about the floor plan, but the way teachers work together and work with their students.